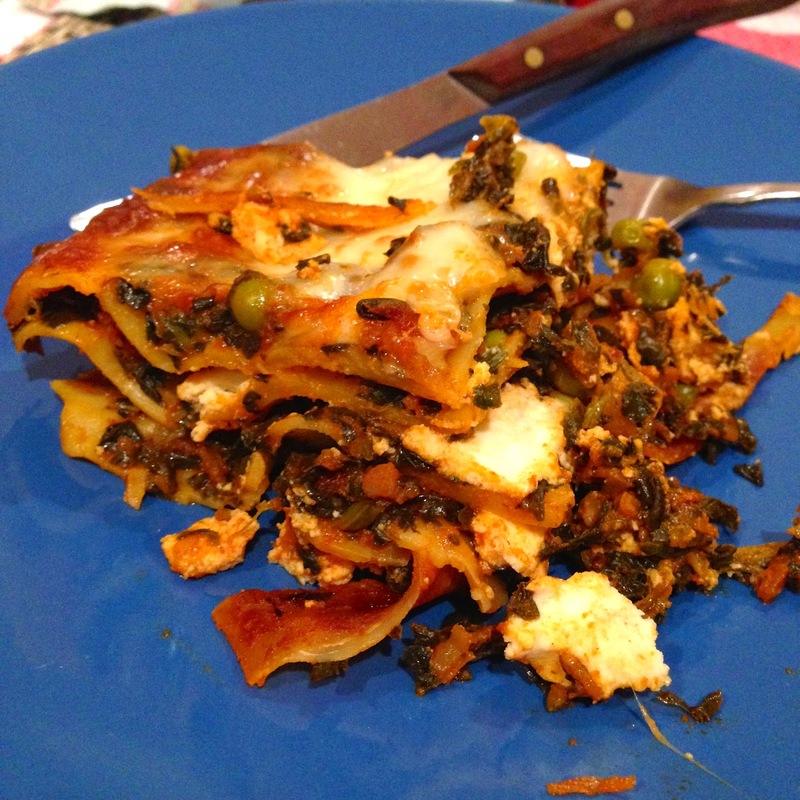 Saag Paneer Lasagna: When Indian and Italian Foods Collide! What do you get when you cross Indian food with Italian food? No, this is not the lead up to a joke's punchline. You get something utterly delicious that I've now made multiple times and can't live without! Really! I keep craving it. It's sooooo good and so easy to make! Saag Paneer Lasagna. What I discovered through making this dish is that lasagna, at least to me, is more of a process, a template, than a very specific thing. You can easily replace the marinara sauce with another sauce, the veggies with other veggies, the protein with other protein, and so on. And that's basically what this recipe is. Trader Joe's sells a delicious Indian Masala Simmer Sauce that makes a perfect substitute for Italian lasagna's traditional marinara. 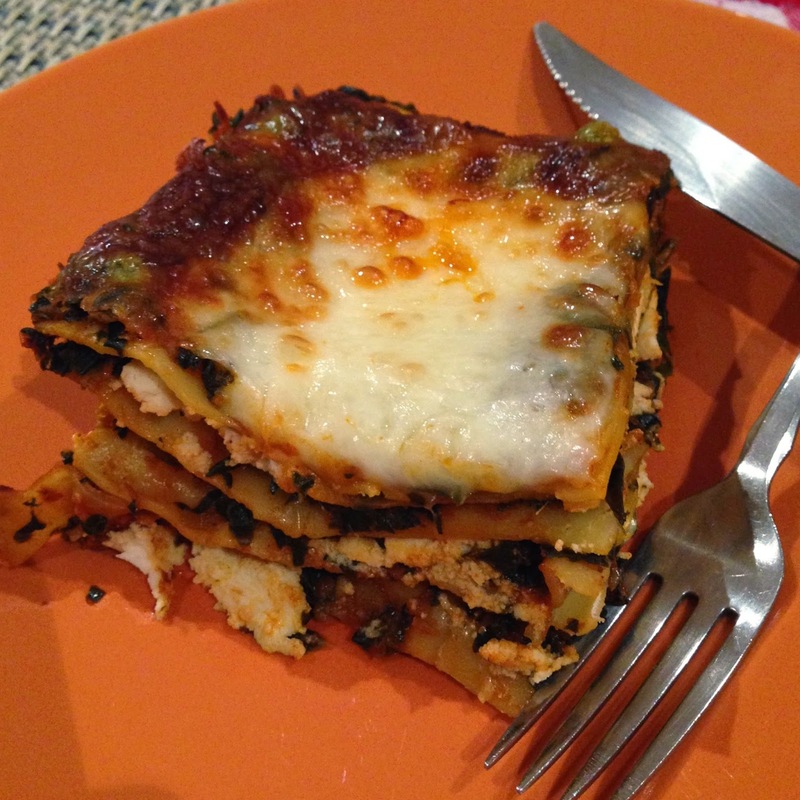 And instead of ground beef, zucchini, onion, and other veggies you might find in Italian lasagna, go for spinach and peas that pair well with the Indian sauce. That's all there really is to it! Because the ingredients don't require much prep (Ha! You do have to open the jar of Masala Simmer Sauce....the horror! ), the whole dish comes together in minutes. And it's fun to assemble the layers! Do it with your kids! Your spouse! Your cat! No, not your cat. The epiphany that lasagna is no more than a template recently drove me to experiment with enchilada sauce. And it worked. Of course it worked! I will be sharing my cross between Italian food and Mexican food soon. Chicken Enchilada Lasagnas are a-comin'. But for now, go forth and make Saag Paneer Lasagna and see what all the hype (that I manufactured) is about. Preheat the oven to 375 degree. Spray or grease a 9x13" baking dish, preferably one with tall sides. Spread about 3 tablespoons of the Masala Simmer Sauce across the bottom of the dish with the back of a spoon. 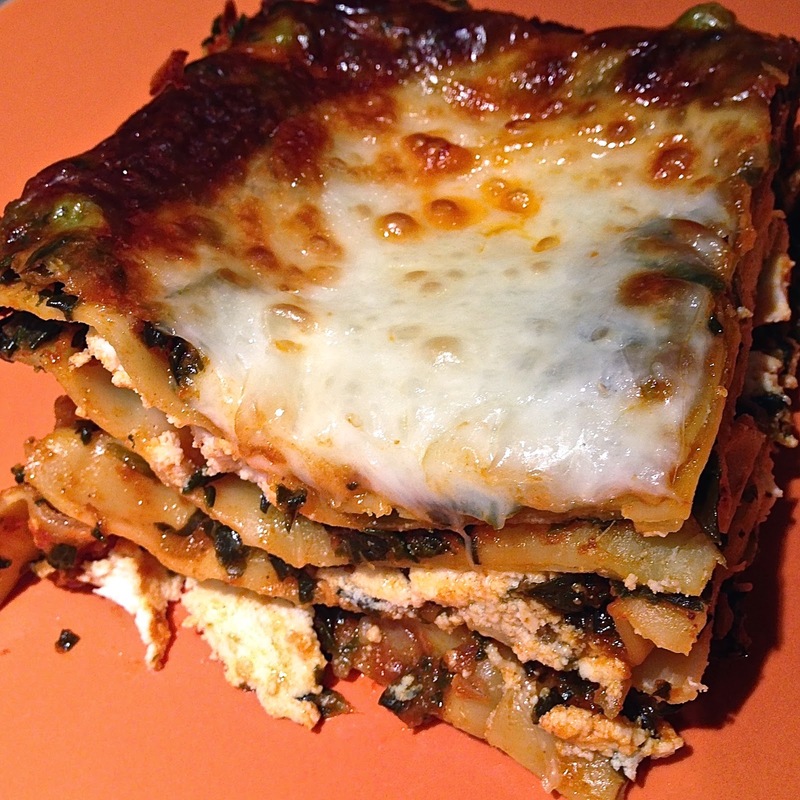 Place a single layer of the lasagna noodles on top (maybe 3 or 4 sheets). Set aside. To make the filling sauce, start by thawing the spinach. Place the spinach in a fine mesh strainer (most pasta colanders seem to be problematic for me because their holes are too large and the spinach will fall through). Run cool water over the spinach and then squeeze dry. Get as much excess water out as possible so you don't make a watery sauce! In a medium bowl, combine the thawed spinach, peas, and remaining Masala Simmer Sauce. Stir to break up the clumps of spinach and make sure everything is incorporated evenly. 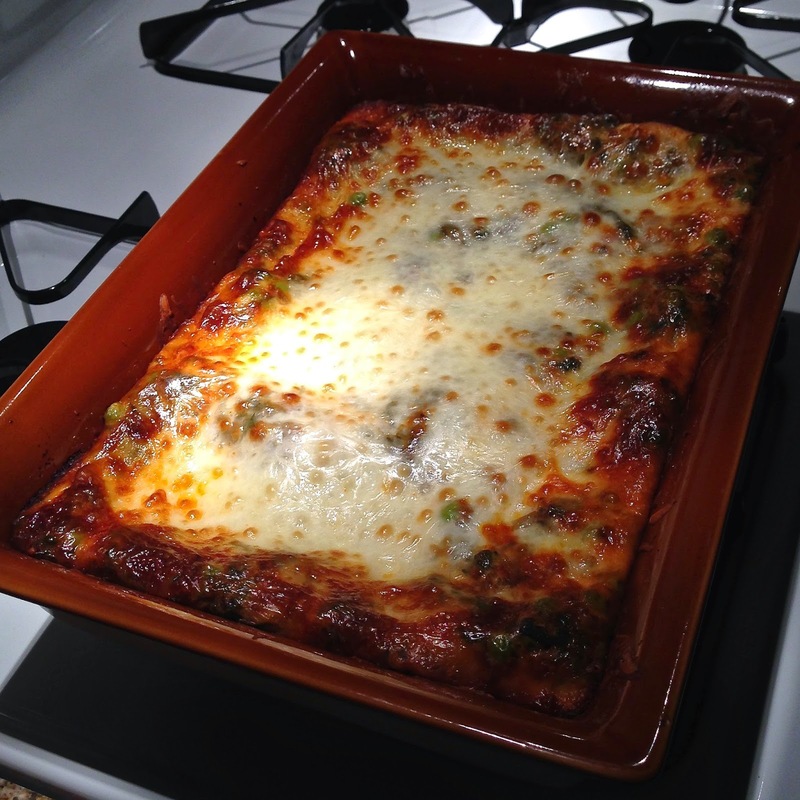 To assemble the lasagna, start by layering 1/4 of the spinach sauce mixture over the pasta sheets in the baking dish. Then dollop 1/3 of the ricotta cheese over the sauce, using a spoon and an offset spatula to gently spread the ricotta around. Top with another single layer of pasta sheets. Press down against the sheets with your hands to push the layers together more tightly. Repeat the layering process two more times. Finally, spread the last 1/4 of the spinach sauce mixture on the pasta sheets and sprinkle the top with mozzarella. Cover with foil, creating a bit of a tent or arch over the top so that as the cheese melts, it doesn't stick to the foil. Bake for 25 minutes and then remove the foil and return the dish to the oven to bake for 20-25 minutes longer, until the cheese is golden and bubbly. Enjoy!